JERUSALEM, Israel (BulgarianMilitary.com) – Rafael performed a first test of launch of its Spike –NLOS from a light vehicle, learned bulgarianMilitary.com. 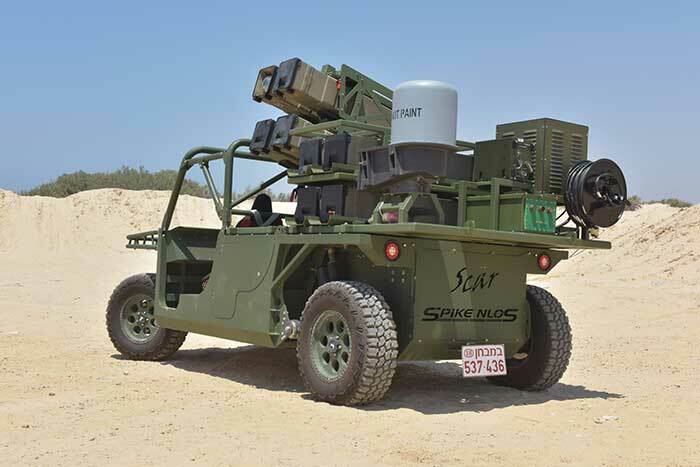 The missiles were launched to a range of more than 25 kilometers from a newly developed light launcher can be mounted on light SUVs, like the TOMCAR off road light vehicle. The SPIKE NLOS Weapon System was highly classified for more than 30 years. The System was designed as a defensive weapon system that can engage targets in great precision and in great ranges. The SPIKE NLOS is combat proven and proved to be an effective tool for both High intensity conflicts (HIC) and Low intensity conflicts (LIC) as well. The Weapon system was upgraded several times during the last 30 years and today according to Rafael, is one of the most advanced and modern precision weapon system. The SPIKE NLOS Missile can be fired in LOS to target using the same principals of the other SPIKE Missiles of tracker lock-on and F&F abilities. The main concept of the weapon system includes the capability to fire in Non Line of sight. The Firing to a NLOS target, is based on grid coordinates using INS/GPS navigation and ending missile flight in terminal guidance based on the Electro optical guidance using missile seeker image transmitted to operator via wireless RF data link. The target coordinates are fed either manually to the SPIKE NLOS system or selected from pre-defined targets or mission data bank. After launch the Missile flight is according to its automatic navigation algorithm. During flight, manual scan of the target area is possible within the Field of Regard (FOR). Pointing to the target may be resumed any time by pushing a button. Reaching a condition threshold; the Missile terminates its automatic navigation. Terminal guidance is either performed by using tracker lock-on or manual steering the seeker. Due to its light weight and small size, it is possible to fly the launching vehicle and land it deep in enemy territory. Zvi M, the head of the Exact Tactical Weapon Systems Administration at Rafael, referred to the experiment, noting that it is a system that will provide the ground forces with standoff launch capability against mobile and stationary targets, independent of GPS. “Rafael continues to develop capabilities and systems at the edge of technology, which provide the maneuverability and precision of the forces in different combat environments, and advantage over the enemy,” stressed M.